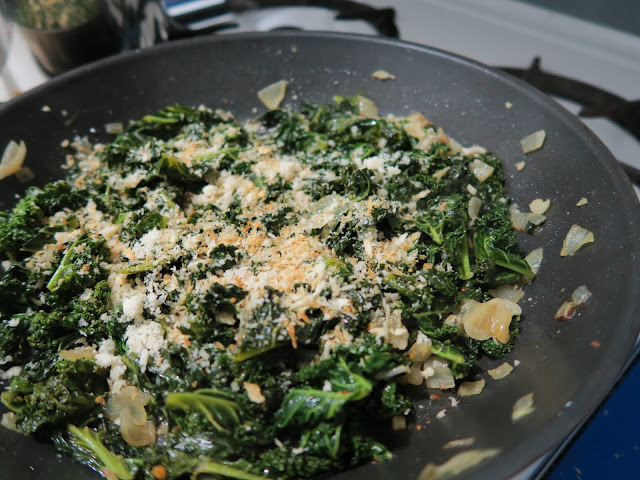 Spicy Tuscan Kale, a recipe that keeps the mad index flicking away. For the past few weeks we've been getting a mixed fruit and vegetable box from a Sydney based fruit and veg company which only supplies Australian produce. We pay a specific amount, choose the ratio of fruit to veg, our favourite items and items we never want in our mixed box and it arrives on a Tuesday after work. It's a great surprise and the produce is much better than what the supermarket stocks. The only down side of it is that I find it really hard to meal plan for the week. Yes I can select my preferences but it doesn't mean for certain I'm going to get an eggplant if I favourite an eggplant that week or mushrooms if I select them. What is does mean is that I end up flicking through cookbook indexes like a mad woman trying to work out what to do with a vegetable I hadn't planned for. I want to say I sit there and flick through my collection gathering inspiration from here and there but reality is on a Wednesday night when I'm hungry, I'm hungry. Last week it was a bunch of kale that was getting me into a grump and here's the thing, I like to have 'go to' recipes when I'm hungry and lacking in time. A recipe I almost don't have to think about and can just find the page in a book or know in my head. I know there are hundreds of kale recipes out there and I'm going to make a broad statement here, most of them are salads or smoothies. I love a good kale salad (see here) but on a cold night I want something warm and comforting, a salad just doesn't kick it for me let alone a green smoothie. I remember seeing a recipe for Spicy Tuscan Kale by Ruth Reichl on Luisa Weiss's blog The Wednesday Chef a few weeks ago and really wanting to give it a go but I didn't have any kale on hand, hoorah! now I did. When I looked at the recipe again she uses three bunches of lacinato kale. I had one bunch of curly kale. I felt the desperation of index flicking creep upon me as it so often does these days, then I thought, stuff it! I'm going to make it with what I have and you know what? I now know what to do with kale when I see it in my mixed box. The desperate search through indexes like a mad woman for kale is over. I found it. My 'go to' kale recipe. It starts with blanching the kale in boiling water and then draining. I cheated by pouring freshly boiled water from the kettle over the kale and letting it sit for about 3 minutes, it saved me washing up a colander. I just tonged the kale out of the water and straight into the frying pan of olive oil doused fried onions and melted anchovies with some chilli flakes and garlic. Don't turn your nose up at the anchovies, its like a rude word for some. They melt down to nothing and give everything a rich saltiness that you can't get from just adding salt. It's all left to cook for about 10 min until the kale has cooked down and is a deep dark green. 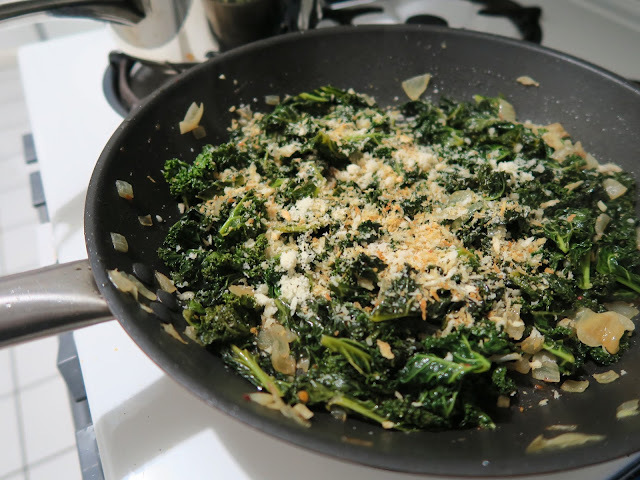 It's then topped and tossed with toasted breadcrumbs and parmesan. A winner in my books on all accounts. Also thinking I might try tossed with some spaghetti with a little crispy pancetta next time... mmm yum. I now have my go to kale recipe... breathe. Recipe adapted from Ruth Reichl found on The Wednesday Chef. - In a large frying pan heat one tablespoon of the olive oil over medium heat and add the anchovies, pressing them into the pan so they almost disintegrate. Then add your onions and cook until translucent, about 5 -8 minutes. - Meanwhile, boil the kettle and place kale in a large bowl. Pour over the freshly boiled water and let sit for about 2-3 minutes. Try and time this so all you have to do next is tong the kale into the frying pan with the translucent onions to save on washing up. If not, drain the kale, rinse under cold water and add to the pan once the onions have done their thing. - After adding the drained kale into the frying pan add the chilli, garlic, salt, pepper and remaining olive oil. 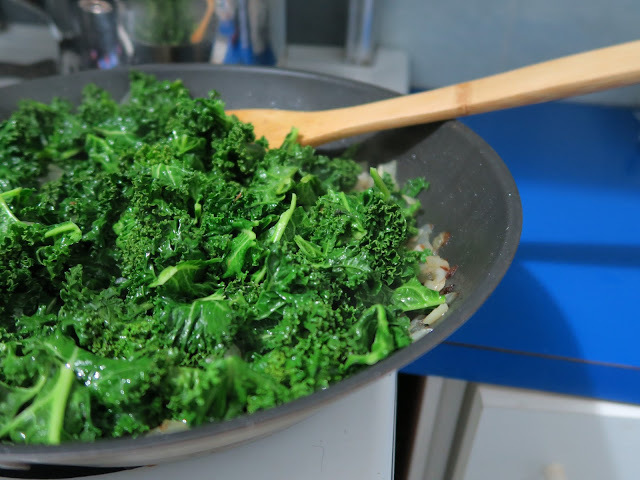 Cook for about 10-12 min, stirring occasionally until the kale has cooked down and is a deep green colour. - Remove from the heat and toss through half of the parmesan and breadcrumbs. To serve, add the remaining parmesan and breadcrumbs on top, this keeps the texture of the breadcrumbs crispy. * To toast the panko breadcrumbs; heat 1 teaspoon olive oil in a small pan with a pinch of salt, stirring frequently over a low heat until the breadcrumbs have become darker and fragrant. Be careful and don't turn your back on them, it's like toasting nuts; can be fine one minute then burn the next.